Intelligent PERFORMANCE - All Explorers have newly optimized linearity and repeatability specifications and enhanced vibration filtering for better balance stability. All models also come standard with AutoCal™ automatic internal calibration. 3�3 filtering setup ensures fast and stable weighing results. The Explorer EX…/E models offer traditional external calibration. These combined enhancements improve accuracy, efficiency, and throughput. Intuitive OPERATION - A large color touch-screen display, icon-driven application software that features 14 unique application modes*, and a 3 level adjustable angle display make Explorer the easiest to use, most advanced balance in its class today. Ingenious DESIGN - The base and display separate for maximum flexibility in any work area. Draftshield models isolate the weighing chamber to enhance stability and speed results while offering maximum accessibility to the weighing chamber through top-mounted side doors or through the versatile top door that flips or slides open. Hands-free entry is available with automated side doors on selected models. Practical Features - Explorer has up to four user-programmable touchless sensors to minimize cross contamination and wear and tear normally associated with repeated touching of the balance. 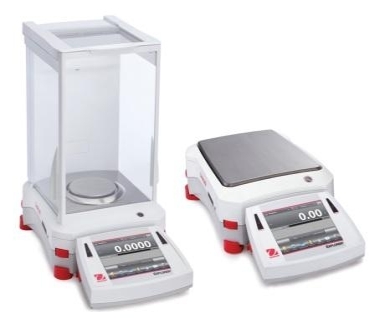 The OHAUS Explorer EX...M series of balances meet or exceed the Class I or II accuracy requirements in accordance with EC directives and EN45501. Models in this range include the EX124, EX10201, EX10201M, EX10202, EX10202M, EX1103, EX1103M, EX12001M, EX124/AD, EX124M/AD, EX2202, EX2202/E, EX223, EX223/E, EX224, EX224/AD, EX224M, EX224M/AD, EX24001M, EX324, EX324/AD, EX324M, EX324M/AD, EX35001M, EX4202, EX4202/E, EX4202M, EX423, EX423/E, EX423M, EX6201, EX6201/E, EX6202, EX6202/E and EX623.